“Russia is a very unexplored political situation”. Until I hear these words from Jericho House‘s artistic director Jonathan Holmes, it is not an omission that I’ve particularly noticed, but the moment the statement is spoken I realise that it’s true. There remains an enduring fascination with Cold War era politics and the Soviet Union, but post-1990s Russian politics has taken a back seat in our concerns. This is something that Jericho House’s new project, Revolution Square, hopes to begin to change. During rehearsals over the past week, Holmes has worked closely and collaboratively with the three actors appearing in the piece, two of whom know Russia very well, a knowledge that has fed into the piece that will now be performed. Rather than existing as a fully-formed script before rehearsals began, Revolution Square has taken shape over the course of rehearsals, moulded into form by various layers of meaning, character and narrative from Holmes and his team. It seems to me an organic, flexible way of working. What stands out about Jericho House’s response is that it is a debate, a true conversation. This is not a closed, blinkered process with a clear end goal or one specific political statement that it is setting out to make. Over the next few days, Holmes and his team are inviting audiences to be as vocal as they like, hosting post-show discussions, handing out feedback forms like candy and welcoming emails with suggestions. Holmes hopes that they will go away with lots of material to eventually make into a longer, finished show that has been informed by multiple perspectives. It strikes me that this is perhaps one of the best ways to approach current events and issues that sweep along in their wake a whole storm of different opinions and perspectives; a piece of theatre can let itself be carried on those gusts rather than obstinately trying to fight a route through them. By the time Revolution Square is finished, it will have been influenced by the immediate witnesses Holmes spoke to in his initial journalistic hunt for information, by the actors involved (and in the case of two of these actors, by their own experiences of Russia) and by numerous audience members, whose reactions will no doubt be coloured by Western culture and attitudes, giving the piece a rich and varied flavour that is hopefully far more representative of actual experience and reactions than one authorial voice could ever be. As Holmes puts it, Revolution Square is ultimately about “seeing the bigger picture”. This widening of the lens applies both to the resonance of Russian politics for the rest of the world and to the myriad of responses that Holmes is inviting to richen and enhance his creation. I personally look forward to adding my perspective to that picture when I get to see the first snapshot later this week. 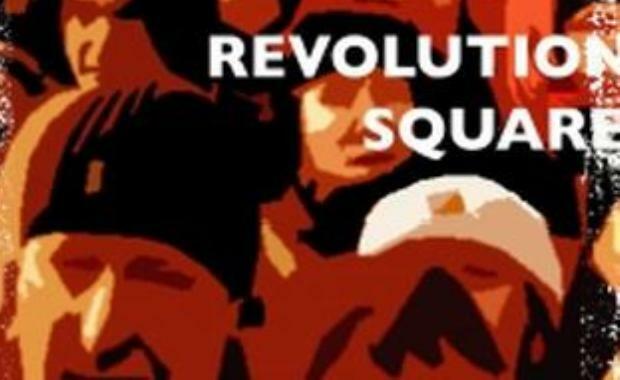 Revolution Square is being performed every evening this week (12 – 17 March) at the Bush Theatre, followed by post-show discussions. Check back for more thoughts on the process on Thursday after I have seen the show.